In this review, we’re looking at the Powerline Home Gym (made by Body-Solid) and we want to start by saying that we think this gym will be a good buy for many people, and a bad buy for some people. 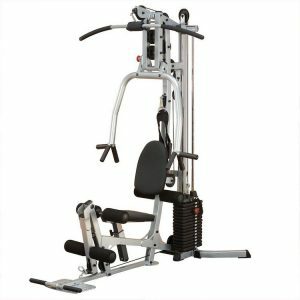 If you’re an experienced weight lifter, or otherwise wanting to do serious bodybuilding, then this machine is definitely not for you. However, if you’re just starting out on your home fitness journey and want to build or maintain some good muscle size and strength, you’re getting back into shape after some time out (e.g., after an injury), or you want to stay fit and healthy as you get older, then this may well be the home gym you’re looking for. Also, this machine is a really good option if you only have a small home workout space. So, let’s get into the review then! This machine has some real positives: It’s well-built, versatile, and compact. It measures in at 80 inches high (6’7 in; 203 cm) x 42 inches wide (3’6 in; 106 cm) x 70 inches long (5’9 in; 177 cm) when fully assembled. 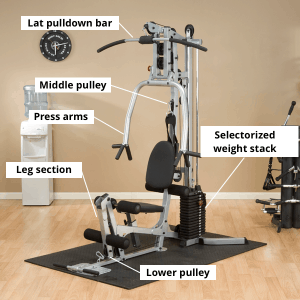 Another advantage of the Powerline Home Gym is that it is delivered partially assembled, which makes the final assembly process much quicker and easier for you. The Powerline Home Gym allows for both horizontal and vertical grip bench presses, as well as incline presses. All of these exercises target your pectoral muscles (pecs), with incline presses hitting your upper pecs more so than the other two. Together these exercises will help you develop strength in your chest. Use the lat pulldown bar to do (you guessed it) lat pulldowns, and use the lower pulley to do upright rows, bent-over rows, and seated aerobic rows. 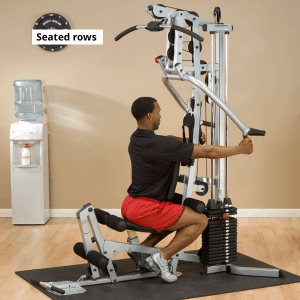 You can also sit facing the back rest and adjust the press arms to do really good seated rows. These exercises will primarily work your latissimus dorsi (lats) as well as your trapezius (traps) and rhomboideus (rhomboids) muscles. You can also do shrugs with the lower pulley to give your traps an intense workout. 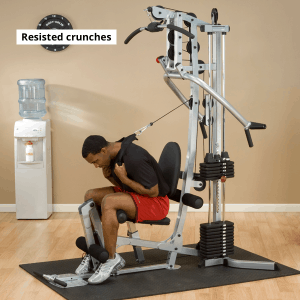 Attach the abdominal strap included with the machine to the middle pulley cable and do resisted crunches, and resisted oblique crunches. These exercises will will develop your abdominal muscles. As with most good home gyms, the Powerline Home Gym allows you to do a solid range of arm exercises. 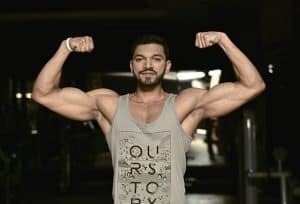 For example, for your triceps you can do standing triceps pushdowns or sitting triceps extensions (using the strap), and for your biceps, standing bicep curls. 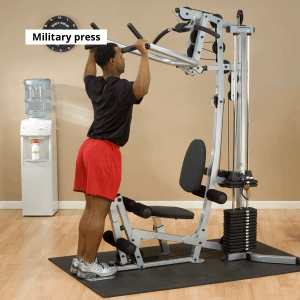 For your deltoids (delts) you can do standing front raises with the short bar attached to the lower pulley and, unlike many other home gyms, you can also do standing military presses with the press arm. The range of leg exercises you can do on the Powerline Home Gym is relatively limited, but this is standard for home gyms like this one. The leg section allows you to do leg extensions for your quadriceps (quads) and standing hamstring curls for your hamstrings. 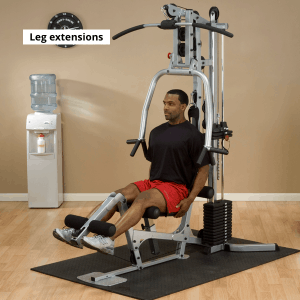 You can also get a leg press attachment for this machine, which attaches at the lower pulley. 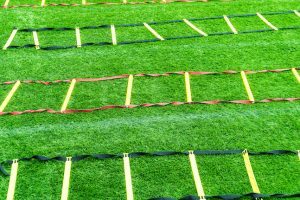 Those are just some of the main exercises you’ll be able to do on the Powerline Home Gym, but as we said, if you put some thought into it you’ll certainly be able to come up with a bunch of extras. 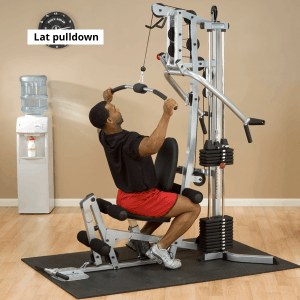 The machine comes with a lat pulldown bar, short bar, and abdominal strap, but Body-Solid also have a Universal Home Gym Accessory Pack, which has a number of attachments that will further increase the number of exercises you can do. That accessory pack also has a 5 lb weight stack adapter plate, which allows you to increase the weight on your exercises in smaller (5 lb) increments. This is really handy for people who find that 10 lb increases in weight are too challenging. The adapter plate can also be purchased on its own, and in a 2.5 lb version. The Powerline Home Gym is a nice and compact home gym, which makes it a good option for people who have a small home workout space, or have other equipment such as a bench, cardio machines and / or free weights. And while it has a relatively standard design, it also has a few really useful features that you won’t find on some comparable home gyms. For example, as we mentioned above, the press arms can be adjusted so that they angle towards the weight stack, which allows you to do seated rows. Rows of all kinds are fantastic strength exercises, and so being able to do them seated in the machine, thus ensuring good form, is a real advantage. We’ll get to the assembly a little later, but one of the selling points of this home gym is that it will arrive with the frame mostly assembled, and the pulleys and cables already strung. The Powerline Home Gym’s structure is certainly good quality. The frame has solid welds and 11-gauge steel beams, and it should be able to withstand even heavy, regular use. In any case, the frame has a 10 year warranty, so if anything does break in that time, you can get it replaced for free. Both the pulleys and cables on this home gym are good quality, albeit the usual kind found on this sort of home gym. The cables have a protective nylon coating that helps increase the life of both the cable and the pulleys they run over, and the pulleys themselves move very smoothly. We think you’ll be pleased with just how smooth and quiet this machine is while you’re working out on it. Unfortunately, the warranty on parts, including cables and pulleys, is only 1 year. This is a real shame considering some of Body-Solid’s other home gyms (like this one) have a lifetime warranty on all parts, and it earns a strike against them. The weight stack is 160 lb (73 kg; 15 x 10 lb weights plus 1 x 10 lb weight cap), which is one of the reasons this machine is not recommended for experienced lifters or people wanting to build serious muscle. If that’s you, you’ll max out on this machine too quickly. For beginners, and people who aren’t aiming to put on a heap of size and strength, 160 lb should be plenty. 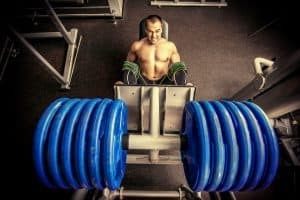 That weight will keep you strong and healthy, but you won’t be winning any bodybuilding competitions with it. The weights themselves are the cast iron type that are standard to this kind of machine. One of the puzzling and slightly annoying things about this 160 lb weight stack is that the stickers you get with it don’t label the weight of each plate (e.g., 10 lb, 20 lb, 30 lb, …), but rather just give them a number (e.g., 1, 2, 3, …). Figuring out the weight you’re using with each exercise isn’t rocket science, but it’s still a weird way of labeling the weights. Lubricate the cables with some lubricant spray (e.g., WD40 or CRC) or bike chain lubricant like this one. This will ensure smooth and quiet performance of the machine, and reduce the wear and tear on the cables and pulleys. Also lubricate the silver poles that guide the weight stack as it moves up and down. This will prevent the weights from getting caught on the poles mid-exercise. You can use lubricant spray for this as well. Use some kind of protective gym flooring beneath the machine. This will absorb some of the impact of the weight stacks as they come down, and protect your floors from damage. The Powerline Home Gym is a really straightforward machine. It has a relatively simple design, and this makes it easy to use. There is no need to make any cable changes, which is good, and adjusting components like the press arm and the weight stack is as easy as removing a pin from one slot, and placing it into another. The seat is also on an adjustable post, so you’ll be able to move it around as needed in order to get your body positioning right for each exercise. 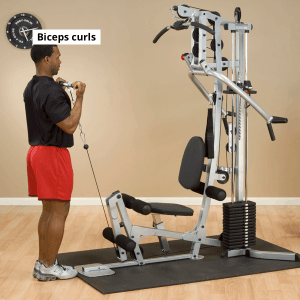 One drawback of pretty much all home gyms is that very tall people will often find it difficult to get resistance through the full range of motion with a few exercises, most notably the lat pulldown. 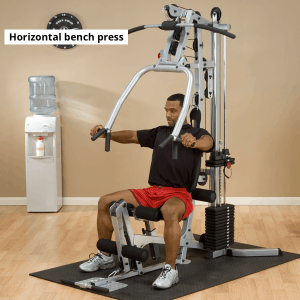 This machine is no different, but adjusting your body position should help correct that problem as much as possible. All in all, once set up correctly, you’ll find this machine a breeze to get started on. As we’ve mentioned, Body-Solid have tried to make the assembly of this machine as easy as possible. It’s delivered in 4 boxes; 3 of the boxes have the weight plates in them, and the remaining, very large box, has the semi-assembled frame and remaining parts in it. They claim that all you need to do is “fasten 9 bolts”. Don’t be fooled by this, you will have to do more. That said, with the frame already partially assembled, the total assembly process is pretty quick and painless. One person should be able to do it, but we always recommend getting a friend or family member to help you out. The assembly instructions that are included aren’t great, but they’re ok. They’re a combination of basic written instructions and exploded diagrams. They can be a little confusing in parts, because they sometimes explain how to assemble parts of the machine that have already been pre-assembled for you. 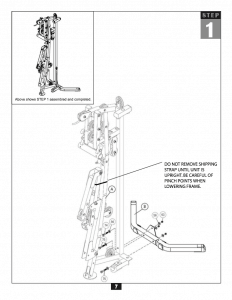 It seems to be a bit of a thing with Body-Solid home gyms to have slightly confusing assembly instructions. Overall, even if you aren’t mechanically inclined you should be able to get this thing together and working properly in 1 – 2 hours at most. You’ll need at least an adjustable wrench and a pair of plyers, as well as the hex wrenches included in the box. If you have a ratchet set, get it out because it will be helpful. The big box that the frame and additional parts comes in is not super heavy, but you’ll want to get a friend to help you move it anyway. If you are planning on setting up the machine in a room that is up or down stairs, or through a narrow doorway, you’ll have to open the box up and carry the pieces in individually. Also, the pre-assembled frame can be moved by one strong person, but again, get a friend to help in order to avoid injuring yourself or damaging anything. Here’s a nice touch from the manufacturer: there are a couple of bottles of touch up paint included with the frame. So don’t be surprised if the paint on the frame has a few little nicks and scratches. Don’t completely fasten all of the bolts until the very end. Trust us, this will be helpful. Place the silver guide poles in position first, and then lift the weight plates onto them. 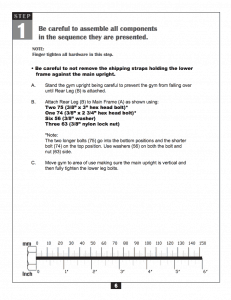 Things won’t line up properly if you try to place the weights in position first and then insert the guide poles. 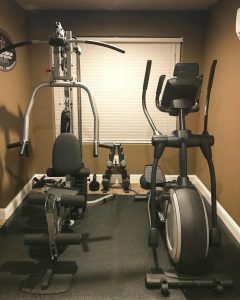 This home gym sits about middle of the range in terms of price: some comparable home gyms are cheaper, and some are more expensive. Considering the fact that this home gym is sturdy, versatile, and compact, we think that if you’re one of the people its most suitable for, then it will certainly be a good buy. Something that is a genuine concern is the measly 1 year warranty on the parts, but we think if you treat the machine with care, this won’t be an issue (as is the case with pretty much all exercise equipment). There really isn’t much more to say than that. 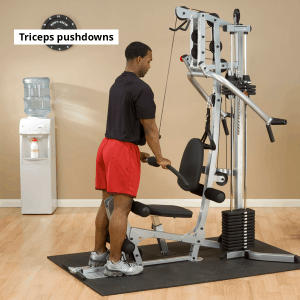 Overall, if you’re a beginner to intermediate level user, are getting yourself back into shape, or just want to stay strong and healthy, then this machine will be a worthwhile addition to your home workout space. 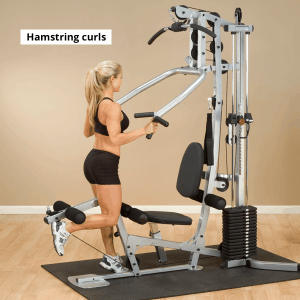 It offers a range of exercises that is better than most similar home gyms, it has a clever, compact and sturdy design, and is built with good quality materials. All the best with your home workouts. Remember: When it comes to our health and fitness, we can make the effort or we can make excuses, but we can’t make both!